One second before touch down of the first aeroplane to land on St Helena. 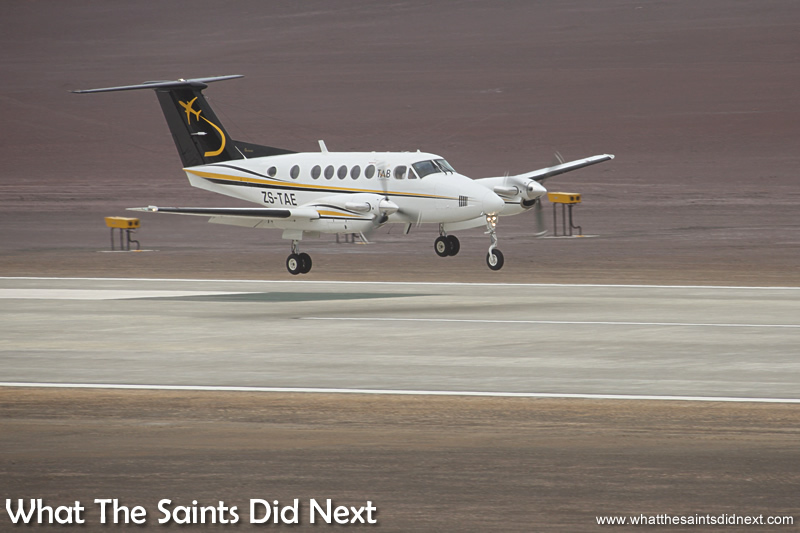 With the delicacy of a gentle kiss the tiny twin prop plane touched down on St Helena’s brand new airport today, yet the impact of this event will ripple into the next 500 years of the island’s history, just as Joao da Nova Castella’s landing by ship did half a millennia ago. Ok, I’m being a bit flowery, but it’s been an incredible day, more than 10 years in the making since the airport was announced and I can’t help myself. The first aeroplane to land on St Helena is here. This may not sound a big deal to some readers but in St Helenian terms it’s akin to landing on the moon! History made. 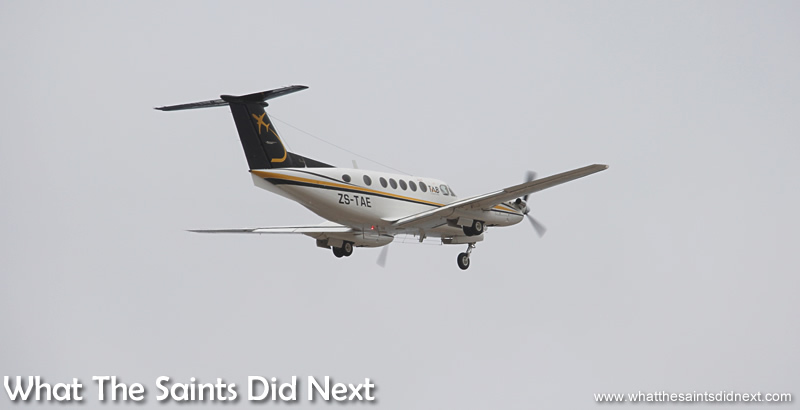 A Beechcraft King Air 200, the first aeroplane to land on St Helena, after a four and half hour flight from Angola, Africa. By my camera’s time stamp, touchdown was exactly 13:44:25. Tuesday 15 September, 2015. Captain Grant Brighton was in command of the specially modified aircraft, having flown all the way from Johannesburg, South Africa, refuelling in Angola before crossing the Atlantic to reach us. It’s now here for a week to carry out airport calibration flights. 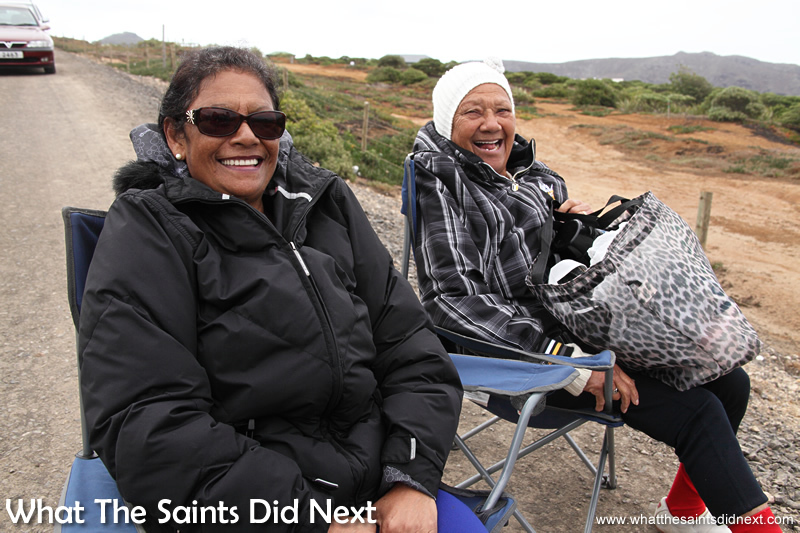 Hundreds of people turned up to watch the historic event of the first aeroplane to land on St Helena. Parking on the slope before Bradley’s Garage. I was one of the few fortunate photographers stationed around the landing strip and lucky enough to capture the historic moment from a great vantage point. A small group of officials and island dignitaries were assembled on the hill to my right, overlooking the terminal building. Over my left shoulder, back up at Bradley’s Garage and the Millennium Forest, nearly a mile away perhaps, hundreds of people had gathered to watch, including Sharon. More were sporadically lined along the ridge out to Horse Point. Even the pilots noticed. 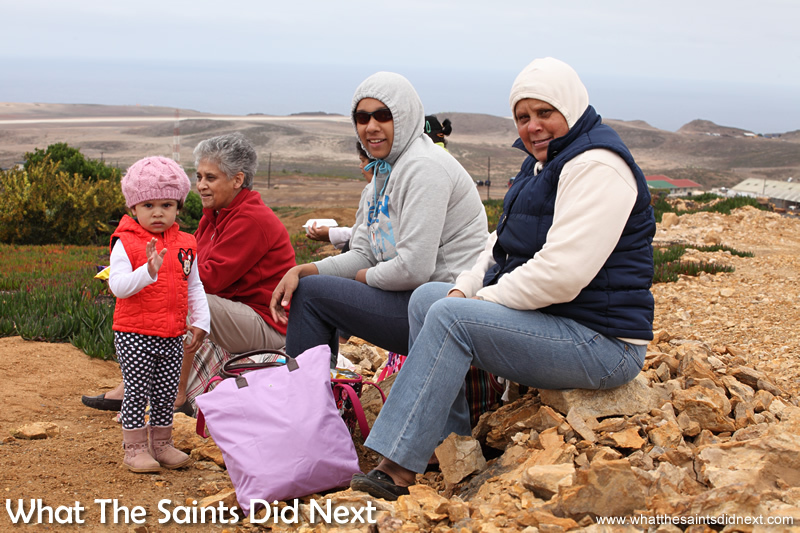 Youngsters watching the moment the first aeroplane to land on St Helena touched down from afar. The second fly-by before landing. Wrapping up well against the chilly September breeze. 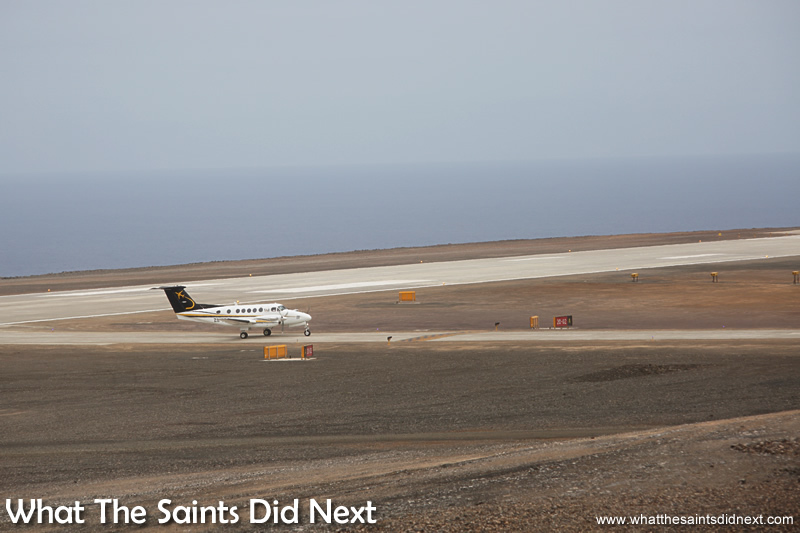 We all wanted to witness it; the moment that many, many (many) people thought would never come; the day the first aeroplane to land on St Helena touched down. At Bradley’s Garage, people of all ages were there, from babies right up to the island’s oldest resident, Ma Flo, at 101 years old. Winter weather (island winter) meant a fleece jacket and beanie dress code and flasks of tea were preferred over something stronger – for most! Some families made a day of it. 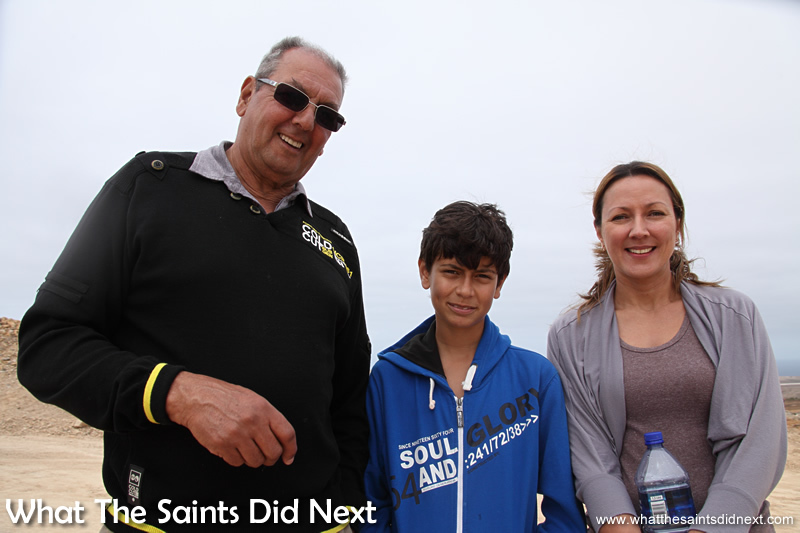 Tommy and Milly Benjamin from Rupert’s Valley were the first to secure a prime spot at 10:30am, along with their son Colin and grandson Lucas. Milly had cooked plo and made tomato paste sandwiches, two St Helena favourites. L-R, Milly, Tommy, Colin & Lucas. Colin: “Everybody is excited and it’s an interesting day for us because we live in Rupert’s Valley, we’ve seen every piece of plant that has been shipped here for the project. We’ve got plo in the back, tomato paste sandwiches, tea, coffee, you name it we’ve got it! We probably have enough food to feed the crew! It’s a very special occasion. 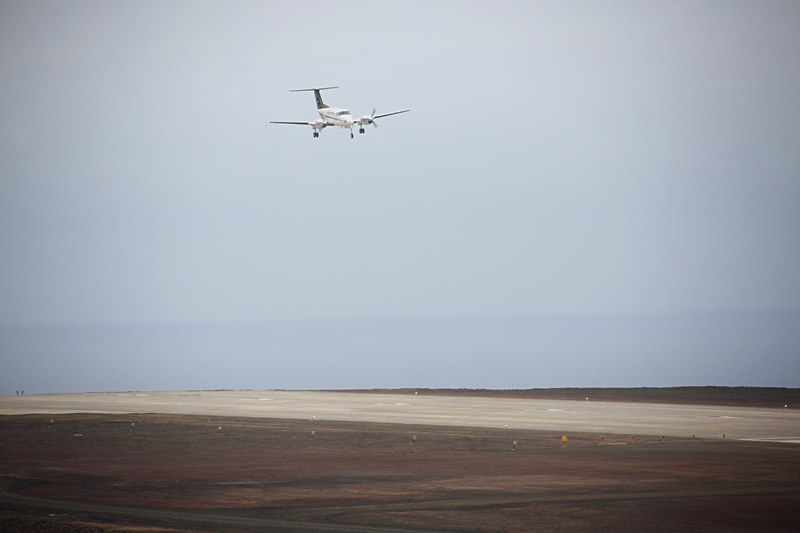 The very first aeroplane to land on St Helena makes its final approach to runway 20. Many people brought fold out chairs for a comfortable view. A sight that is soon to become normal – a plane landing on St Helena. The plane, when it did arrive, treated us to two fly-bys before landing. Okay, it wasn’t just as a treat for us on the ground, they were checking for “wind shear” as planned. The first was a high speed pass; the second was slower and a bit lower. And then, the ‘historic’ moment. 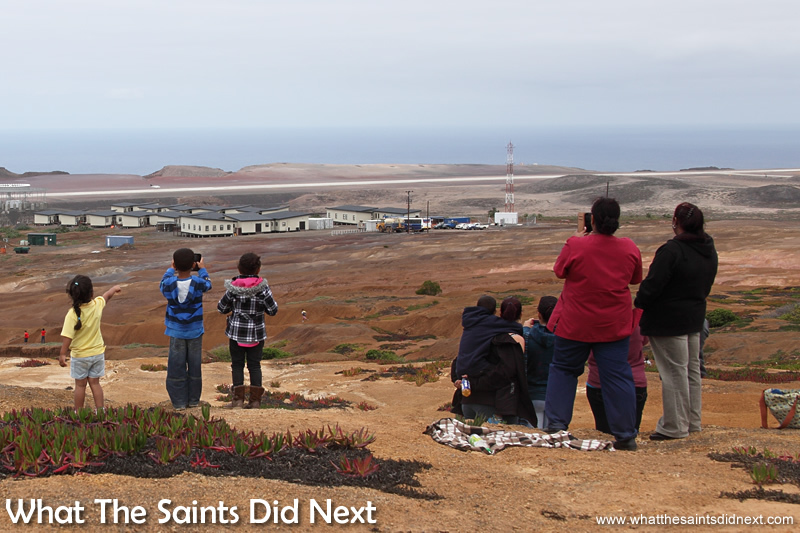 First airplane landing on St Helena Island. On final approach I could see the aircraft moving around quite a bit; the wings dipped first one way, then the other as the pilot made adjustments to find the right alignment. From a long way out I was aware of a bright light on the front of the plane; closer in the undercarriage caught my eye, dangling down reaching for the ground. And then suddenly the plane was over the runway, gliding gently down. The left wheel and the nose wheel touched down first, then the right. The left wheel did the tiniest of bounces, rising up off the runway before settling, and then the plane was fully down. History made. The first aeroplane to land on St Helena, ever. 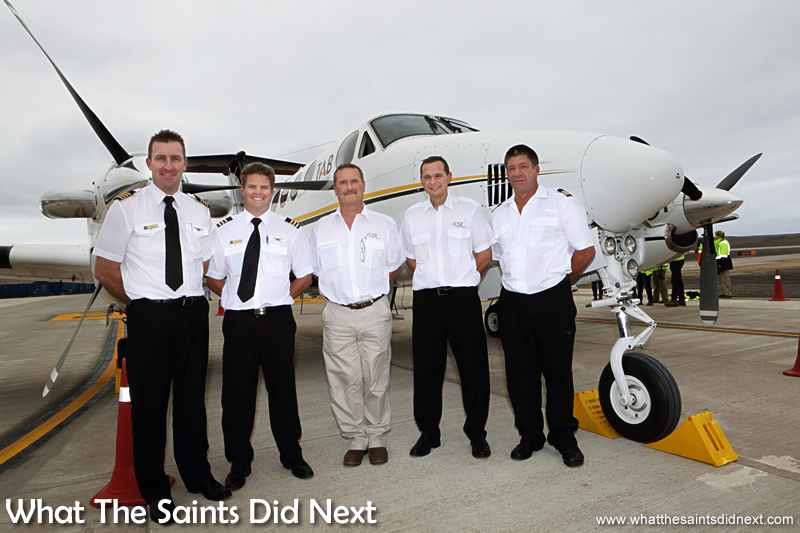 The aircraft crew for the first aeroplane to land on St Helena comprised Captain Grant Brighton, Co-pilot and First Officer, Dillan Van Niekerk, Chief Flight Inspector Nick Whitehouse, FCSL Chief Pilot, Stuart Rawlinson, and Chief Aircraft Engineer, Jeffrey McKenzie. 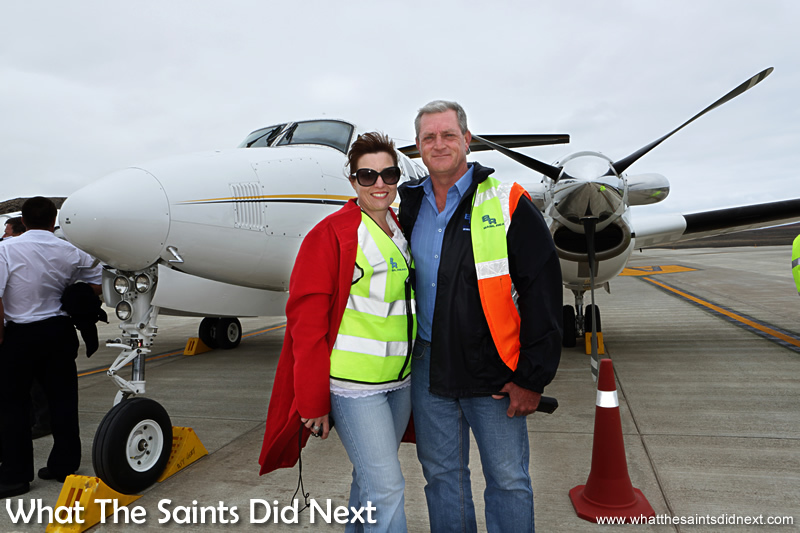 South African contractors, Basil Read, have built the airport on St Helena, led by their Island Director, Deon De Jager, who was there with his wife, Chrezelda, to welcome the flight. 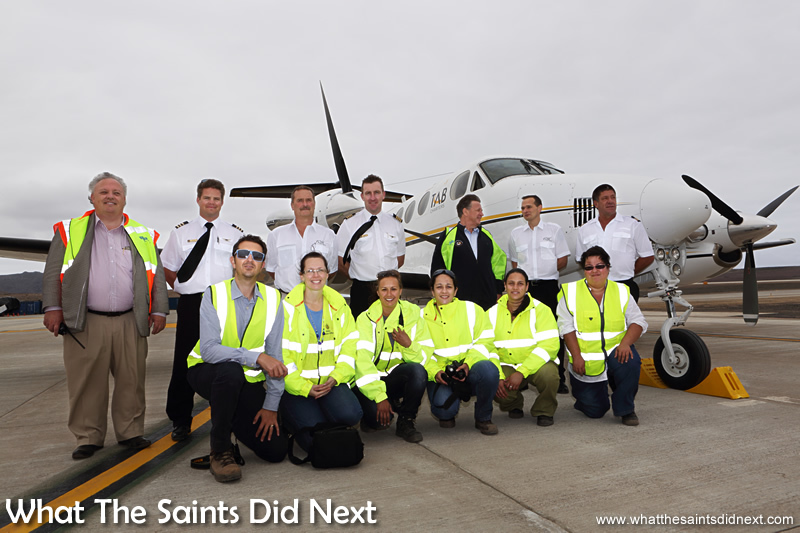 The St Helena Access Team (front) and newly appointed Airport Manager, Nigel Spackman, posing the with flight crew. Like a lot of Saints, probably most, who have looked forward to this day for so long both Sharon and I were filled with mixed emotions. Sorrow for family and friends who dreamed with us of this day but sadly never lived to see it. But also happiness for the potential of positive change that now lies ahead, especially for the youngsters. Commercial flights to St Helena should begin early in 2016 and a 500 year culture of exclusive sea travel to the island will come to an end. 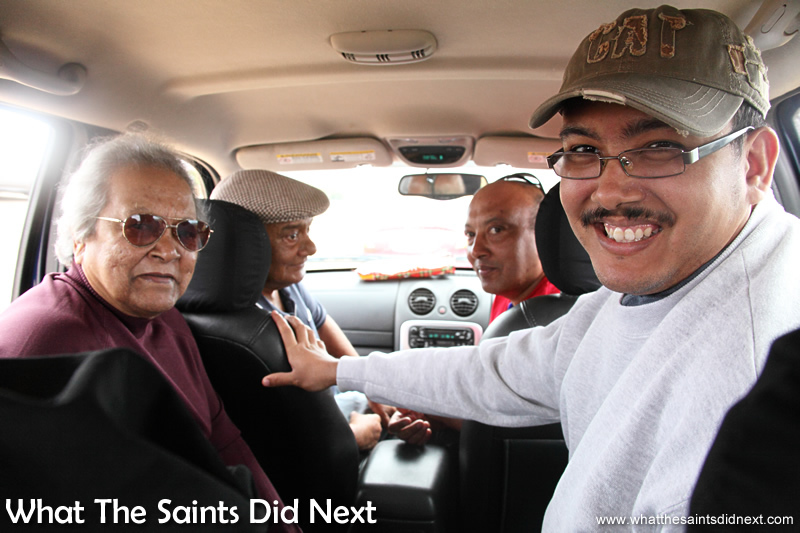 We all have our thoughts on what this now means and how it affects us as residents of St Helena. 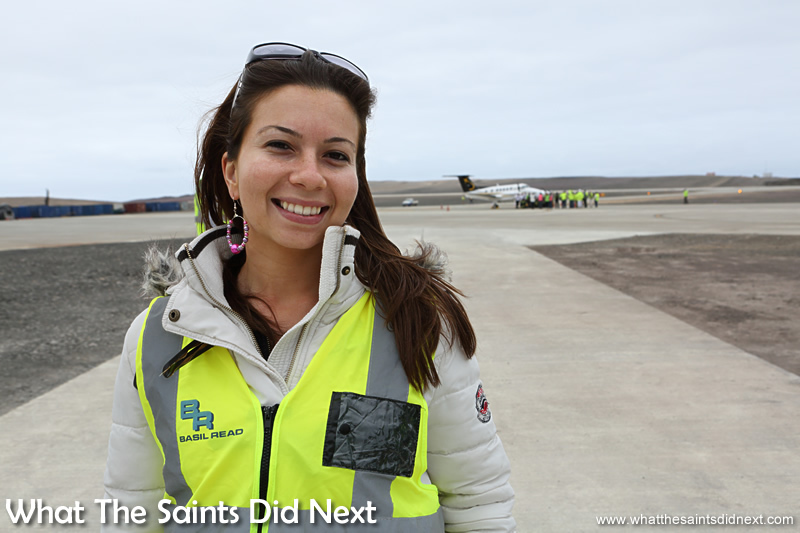 Reigning Miss St Helena, Sinead Green, was part of the welcoming committee to greet the flight crew. 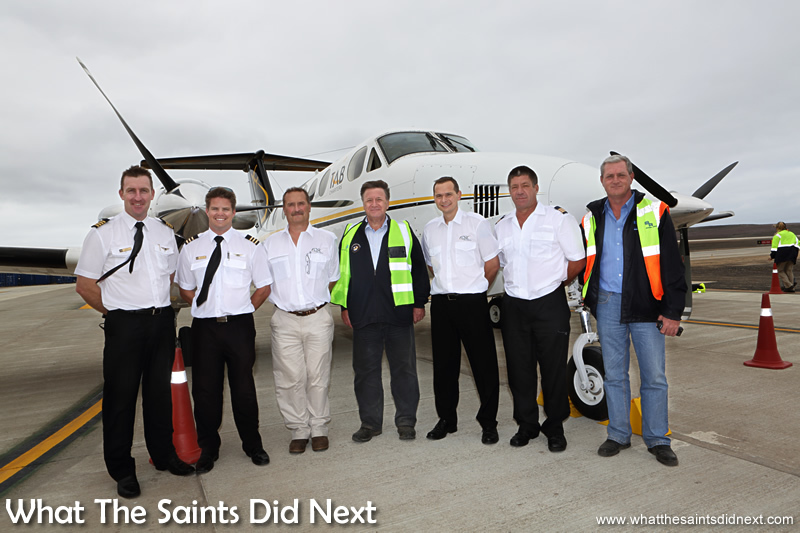 The flight crew of the first aeroplane to land on St Helena with Island Governor, Mark Capes (centre) and Basil Read Island Director, Deon De Jager. We could go on forever discussing the possibilities that now lie ahead. It’s exciting, stimulating and perhaps just a little bit scary as well. But what a day it’s been. Just over 500 years ago the island woke up with a ship anchored off Jamestown for the very first time. Tomorrow when the sun peeps up over Prosperous Bay Plain, there will be an aeroplane sitting on the island for the very first time. Incredible. The new normal. 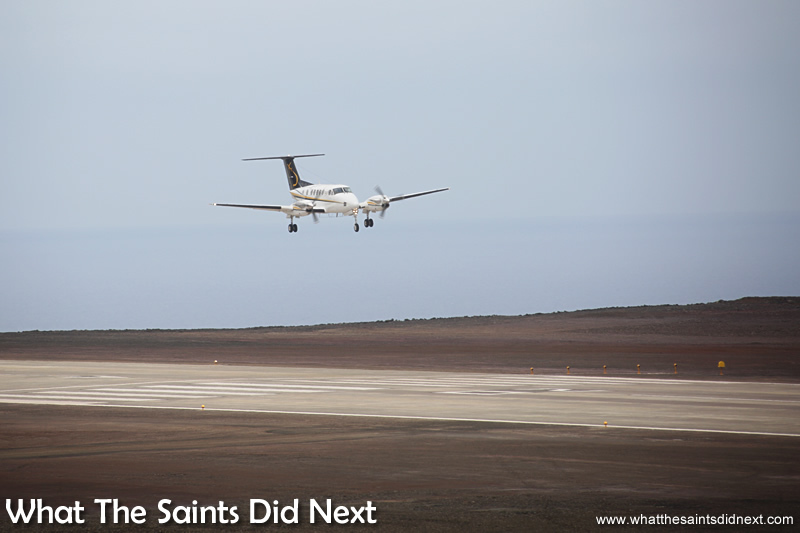 Airplanes on St Helena. 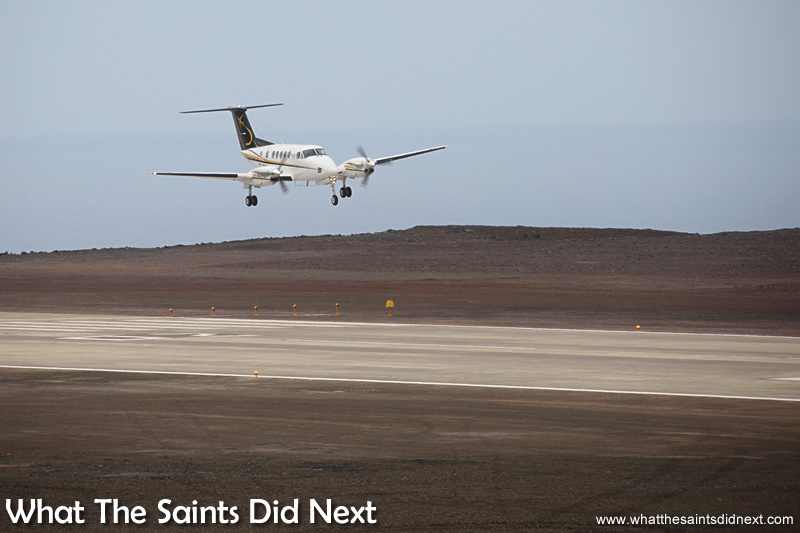 2018 update: For more facts about the St Helena Airport, click here. Great pictures, what a day that was for us all, look forward to great things to come for our island once the airport become operational. Thanks Lawson. It really was a wonderful day and we were so priviliged to be there. Looking forward as well to the possibilities for us all. Great move in respect to airline safety too, as it looks like a good location for a Southern Trans-Atlantic emergency landing strip. I would think that you will see ships at port to supply Jet fuel as well as other aviation supplies. Thanks LL for your comment. There are bound to be many side benefits that many of us haven’t even thought about yet. 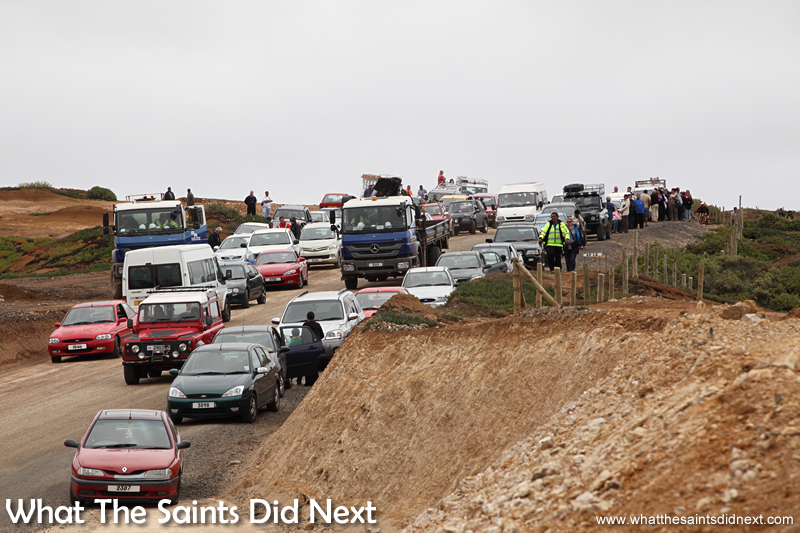 For sure we will always have sea traffic to St Helena even with the airport. Cheers. 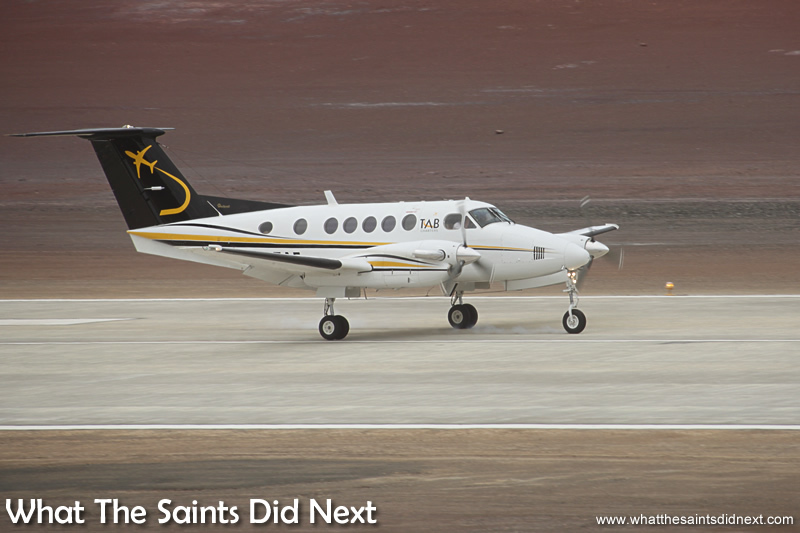 Just one question; If the Kingair could for any reason not land on St Helena, did it have enough fuel on board to fly another four and half hours back to where it came from????? Congratulations from North Carolina, we had a first landing back in 1903 and it has been great for us. You have a beautiful airport. 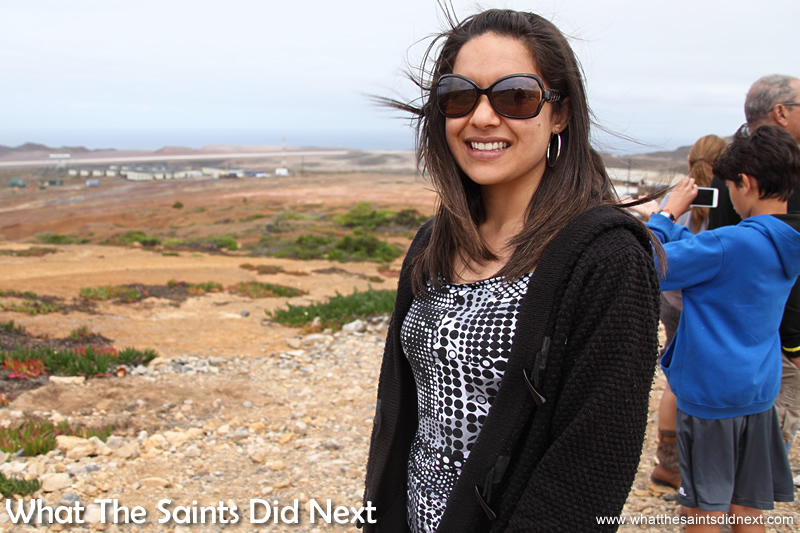 A lot more people will be able to visit your beautiful island, and maybe we might get to try some Saint Helena coffee. I understand that once regular flights commence, the ship will cease. Is this for commercial cargo and passengers or only passengers? Is this not risky as seafreight is also important? Also can I ask where exactly is the runway situated on the Island? Is there a map showing its location? All in all – congrats – good move. The old fashion way is quaint and a pity it is gone, but life has to move on sadly. This is a step in an improved direction. Best news in a long while. I will now be able to visit the island of my Grandmother’s birth very soon. Her name was Rosina Benjamin, who together with her sister Winnie and brother Victor, settled in Cape Town many years ago. I think you’re journey will be one of many more that now becomes possible Malvin. We have been discussing the connections and possibilities before us now and it is just wonderful. Hope to see you on the island soon. Thanks for commenting. Yes it is. We saw it happen yesterday and still woke up today with a real buzz. Thanks for your comment. Thanks Peet. You summed it up perfectly, “Will open a new world.” It was an amazing experience to be there. On the one hand I am really happy to see the Air Link finally come to St Helena. 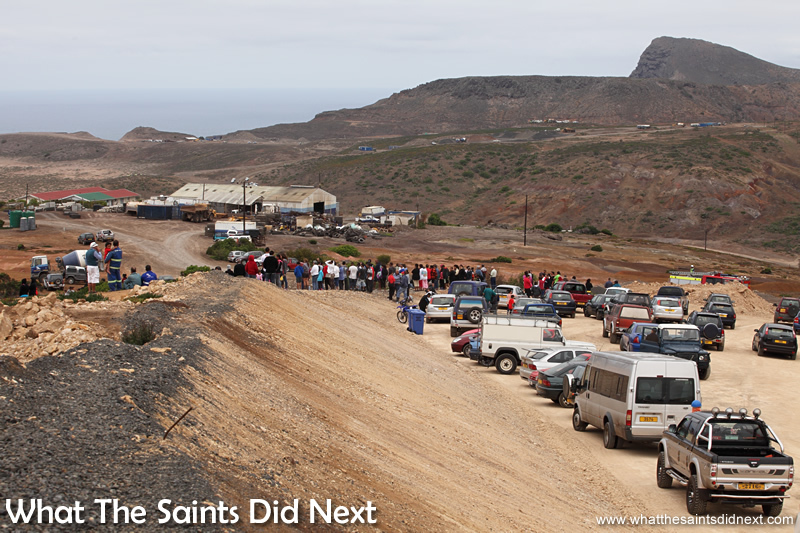 On the other it is really sad that it will lead to the complete isolation of the St Helena Communities on Ascension Island and the Falklands, as HMG/SHG have chosen not to include a link of any sort. Even more shocking when you consider that it was the votes from the Falklands and Ascension (in the Air Access referendum) which carried the decision. Thanks for the comment John, always appreciate your input. Both Sharon and I spent many years working living on Ascension. Hope this issue is sorted out soonest for everyone. I’ve wanted to take the RMS St Helena for a visit, but as it going out of commission I may just have to take a plane instead. Your new airport looks lovely. The airport is pretty spectacular. Pretty soon we’ll all be getting used to the new view on approach out the window. Cheers. An excellent account for the history books. Please let this be a real positive for the wonderful people of this amazing little island. Great reporting Darrin. For those of us who would have liked to be present for the historic day you helped provide a real ‘taste’ of the occasion. 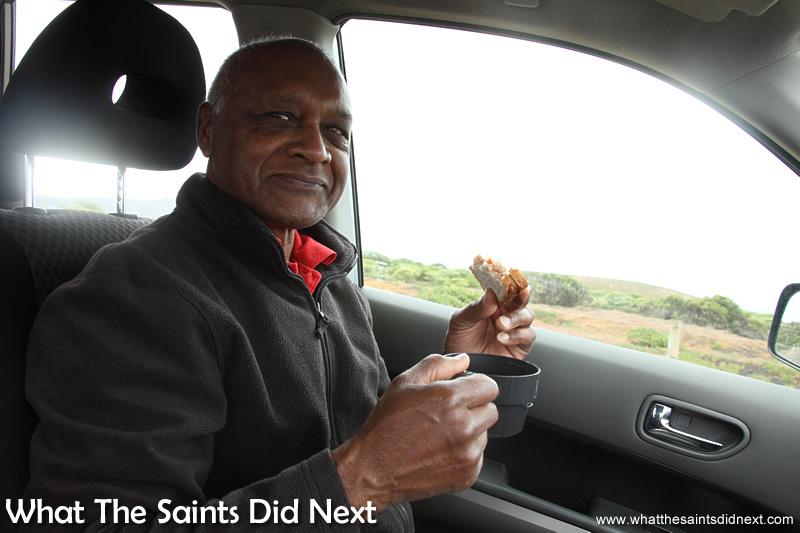 Thanks Roger, we really did feel proud to be there on behalf of Saints and friends of St Helena everywhere who couldn’t be. It was a special day.